Once again, the SPS IPC Drives automation and motion engineering mega-show, held every November in Nuremberg, Germany, proved to be a bellwether for the state of the sector – especially in Germany – and an indicator of the trends that are driving the industry. One noticeable theme was the number of collaborative efforts being set up by companies and organisations that might normally be considered rivals. Visitor and exhibitor numbers at the 2016 SPS IPC Drives show were down slightly on those for 2015. By the time the doors closed on the three-day show, 63,291 people had visited the event (down from 64,386 in 2015), while the exhibition attracted 1,605 exhibitors (compared to 1,668 the previous year). More than 500 of the exhibitors came from 44 countries outside Germany, and about a quarter of the visitors had travelled to Germany. In terms of technical trends, Industry 4.0 was still a powerful force – as it has been for several years now – while many of the exhibitors were emphasising the growing importance of the cloud. Another noticeable trend, especially in the communications sector, was the number of collaborations between companies and organisations. For example, several automation suppliers, including ABB, Bosch Rexroth, GE, NI, Parker Hannifin, SEW-Eurodrive and Schneider, threw their weight behind the OPC UA Time Sensitive Networking (TSN) technology. Most major automation suppliers are teaming up with specialist cloud services providers to exploit this technology, while even in more traditional areas, such as linear production transport systems, collaborations are becoming the norm – for example, between Festo and Siemens, B&R and ATS Automation and, most recently, Mitsubishi and APT Automation. Details of some of the key launches and other developments announced at the show can be found in this report and elsewhere on this Web site. ABB emphasised its continuing commitment to DC drives by launching a series that use the same control panel, features and tools as its AC drives, making it easier for users who have both AC and DC drives. The DCS880 drives have built-in Safe Torque Off functions and can interface with all of the main fieldbuses. They can also be integrated with ABB’s Zenon software to collect, analyse, visualise and manage data. Another new arrival from ABB is range of IEC-frame stainless-steel encapsulated motors for washdown environments. 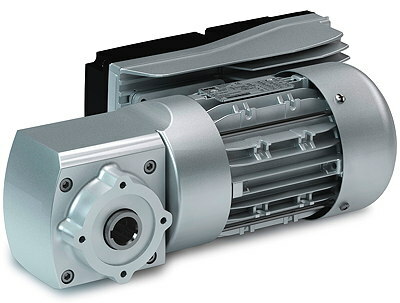 The IP69K-protected TENV motors (shown below) have smooth, self-draining surfaces and can handle water sprays up to 80°C and 100 bar. They are available in efficiency classes IE3 to IE5 (with VSD control) and will initially cover ratings from 0.37–1.5kW (with 7.5kW due soon). They come in two- to six-pole versions for 230–690V supplies, 50 or 60Hz. ABB is also offering a dynamic motion control package, based on its MicroFlex e190 servodrive sand eSM servomotors, which it claims can reduce installation footprints by up to 40%. The single- or three-phase servodrives are rated from 0.4–3kW, 105–230V AC, and can be connected by a DC bus, allowing energy to be shared. 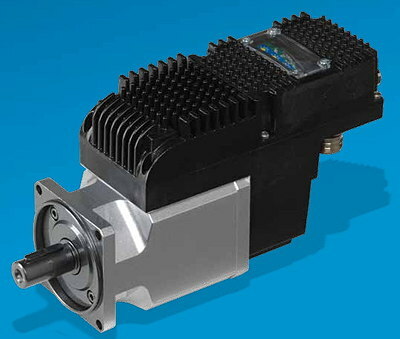 The motors use special materials and compact windings to provide a high torque density and low losses, and a torque overload capacity of up to 300%. New from Bauer Gear Motor is a motor-mounted inverter drive (the EtaK2.0), said to offer high levels of speed and torque control and high efficiency. 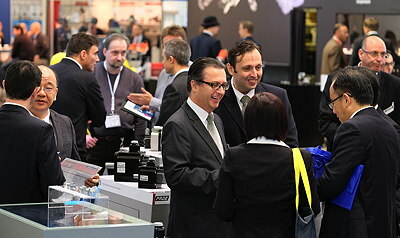 Baumüller was showing several new and enhanced ranges, including a new series of precision servomotors with low detent torque and high control accuracy. The DSH1 motors (below) come in frame sizes 45–100, with outputs up to 10kW and top speeds up to 6,000 rpm. They use the same mechanical interfaces and connections as the company’s existing servomotors, simplifying upgrades. Baumüller has also expanded its DS2 servomotor family, with higher speeds (up to 4,500 rpm), improved acceleration and a wider power range (using water or oil cooling). 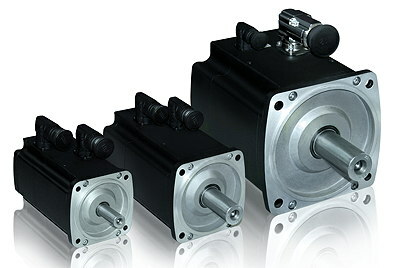 The motors come in four sizes from 100–200. Baumüller has also raised the speed and power ratings of its DST2 high-torque motors which can now hit speeds of 2,000 rpm in sizes 135–400. Power ratings in size 400 have risen from 320kW to 530kW. A 560-frame version is being developed. Turning to drives, Baumüller has introduced an intermediate-circuit unit for its b maXX 5000 converters, which can store brake energy in a buffer and then use it to boost acceleration and save energy. The company has also added Ethernet/IP support for these drives. Baumüller’s 0.8–5kW b maXX 3300 servo controller is now optionally available in a single-phase version and can be used with an external braking resistor. Bonfiglioli announced an integrated drive combining a dynamic sevomotor with a drive controller. The iBMD drive (below) can deliver 2.7–36Nm of torque and offers functions such as positioning, cam profiles and electronic gears. It supports communications via CANopen and EtherCat, and can be combined with Bonfiglioli’s planetary gears. Control Techniques – appearing without its Emerson branding, but not yet displaying the livery of its new owner, Nidec – was promoting the addition of on-board Profinet to its flagship Unidrive M700 VSD. It was also displaying larger frame size 11 cabinets and demonstrating the new ability to set up Unidrive M drives via a Web browser. Delta Line was showing three new ranges of small (16 and 22mm diameter) brushless motors from Portescap, optimised for different characteristics. The high-performance ECS version of the Ultra EC motors can achieve 180W at 50,000 rpm. The high-torque ECT version offers torque ratings up to 150% higher, while the lower-cost ECP versions are said to deliver 30% higher torque and 100% more power than rivals. The motors, with a “unique” coil design, have low iron loses and efficiencies up to 91%, leading to low operating temperatures and long service lives. Eaton announced an enhanced version of its PowerXL DC1 inverter, which now supports IE4 motors including permanent magnet, brushless DC and synchronous reluctance types. Sensorless vector control has been added, opening up new applications involving extreme load fluctuations, while a “fire mode” ignores errors and warning messages to help extract smoke in HVAC applications. A second acceleration or deceleration ramp can be set for pump applications and the VSD switches to these when a certain frequency is reached. AC flux braking has been added and there are 30 new monitoring parameters. Fuji Electric was demonstrating an IP65-protected, naturally-cooled, water- and dust-proof inverter that uses silicon carbide power semiconductors, said to cut main circuit power losses by 44%. The IP6X inverters can be used outside electrical panels in ambient temperatures from –10 to +50°C. Hitachi has a new family of modular, high-performance inverters covering power ratings from 1.5–160kW. The SJ series, type P1 drives have three easy-access slots which can accommodate various fieldbus and I/O options,­ including Ethernet, EtherCat, Profibus-DP, Profinet, safety, analogue I/O and relay outputs. The drives support STO, with SS1, SBC, SLS, safe direction and safe speed monitoring available as options. They can be used with induction or permanent magnet motors. The Swiss conveyor drive specialist Interroll used SPS IPC Drives to preview a new synchronous drum motor developed for precision positioning, and designed to cope with abrupt acceleration and deceleration and to deliver highly dynamic operation with high torque. The new motor (below), which will be available in ratings up to 1.1kW, supports smaller turning diameters, allowing it to convey smaller items. It is said to ensure high, efficient throughput of materials. The Danish motor manufacturer JVL launched a new generation of Nema 23 integrated stepper motors with a resolution of 409,600 steps per revolution, leading to smooth, silent running. 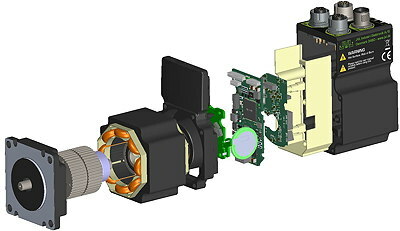 The MIS23 motors (shown below in an exploded view) come in two versions: standard, with ratings of 1.1–2.5Nm in lengths from 102–170mm; and ultra-high torque models, with magnets in their rotors, delivering 1.6Nm in a 102mm-long-version, or 2.5Nm in a 122mm version. The motors offer a speed precision of 0.01 rpm and an acceleration precision of 1 rpm/s. Thy have eight configurable I/O and up to 254 of the motors can be linked together. JVL has also added optional Profinet support to all of its integrated servomotors in ratings from 50W–3kW. KEB was previewing its Combivert F6 family of compact VSDs spanning ratings from 4–400kW in seven sizes. The drives offer automatic anti-cogging and optimised torque control for linear and non-linear motion. Two sensorless control systems are built in, allowing control of synchronous or asynchronous motors. On-board communications include EtherCat, Varan and CanOpen, with Profinet and Powerlink via real-time Ethernet interfaces. There’s a two-channel port for all types of encoder. Kollmorgen was previewing a new generation of its AKD servo amplifiers with new processors that support faster control performance. The AKD2G amplifiers also incorporate Safe Brake Control and Safe Brake Test functions, providing a cost-effective way of making vertical axes safe without needing protective fences. Lenze showcased a range of “smart” integrated motors (below) targeting horizontal materials-handling applications. The m350 drives – which combine a gearbox, motor, electronics and software, with the option of a brake – come in three sizes with torque ratings of 25, 50 and 75Nm. Maintaining the same torque, speeds of 42–216 rpm can be selected from a smartphone using wireless NFC communications. Ramp and brake control functions are built in, ensuring smooth transport of items. 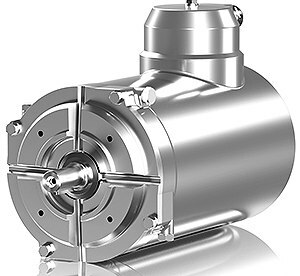 Leroy-Somer has added a liquid-cooled version to its IMfinity range of induction motors, helping to cut noise levels, save energy and ease integration. There is also a package that combines an IMfinity brake-motor with helical gears and a Control Techniques Unidrive M VSD. Leroy’s Unimotor fm servomotor can now operate optionally without a feedback device, while the Unimotor fm and hd ranges are now available in single-cable versions. Moog has released a family of fan-cooled brushless servomotors said to offer 30% more torque than naturally-cooled machines. Coupled with low rotor inertias, this is said to result in higher power densities and shorter cycle times. The fan cooling is available for sizes 5 and 6 of Moog’s CD (compact dynamic) and MD (maximum dynamic) servomotors. Kits are also available to add fan cooling to Moog’s existing naturally-cooled motors. Rexroth has added fan- and water-cooled variants to its IndraDyn S MS2N series of synchronous servomotors with maximum torque levels from 4–360Nm. Fan-cooling increases the motors’ power density and energy efficiency, allowing new working points with higher continuous torque levels without having use larger motors. A new Hiperface encoder option offers certified safety to SIL 2 / PL d, and allows motor operating data to be stored in the encoder memory and processed by IndrDrive controllers to improve torque accuracy. The motor can now act as a sensor and data source for Industry 4.0 applications. Rexroth has also added 525–690V variants to the existing 380–500V versions of its IndraDrive ML modular inverters which can now produce 110–500kW per device, or 4MW if eight devices are operated in parallel. SEW-Eurodrive has announced a new size 1 version of its Movigear MGF-DSM series of low-power mechatronic drives targeting applications with torque ratings from 10–100Nm. The compact, low-weight drives offer constant torque and high system efficiencies. In its constantly-busy hall, Siemens was demonstrating a new range of modular high-voltage motors in ratings up to 70MW. The Simotics HV HP motors are available in synchronous or induction versions, and high- or low-temperature variants, with gas and dust explosion protection and choice of cooling methods. The motors, available on short lead times, have base frames said to minimise noise and vibration. A new firmware version (v4.8) for Siemens’ Sinamics S120 low-voltage converters allows them to be used with its Simotics synchronous reluctance motors – especially in applications where the dynamic performance of induction motors would be insufficient, but the high performance of permanently excited synchronous reluctance motors would be excessive. In part-load applications, synchronous reluctance drives are more efficient than induction motors, with payback periods of less than 12 months, according to Siemens. 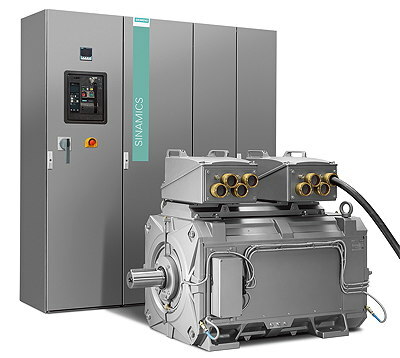 In another development, Siemens is offering a package (shown below) that combines water-cooled versions of its Simotics FD motors and Sinamics S120 converters and allows them to share their cooling circuits. This avoids the need for a recooling module for the converter and results in lower purchase and running costs, as well as reducing the amount of space needed and improving efficiency. Elsewhere, Siemens announced three new high-power frame sizes for its Sinamics G120C converters, adding ratings from 22–132kW and expanding the range to cover 0.55–132kW. Components such as DC chokes and EMC filters are built in, and an STO function is standard. There are also two new power modules for the Sinamics G120P family, extending it to 400V and 690V operation. The PM240P-2 module is available in an IP20 version for ratings from 22–132kW, and IP20 or IP55 from 75–132kW. The PM330 module extends the G120P ratings to 630kW. SMC launched a pair of stepper motor controllers: the JXCP1 for use in Profinet networks; and the JXC91 for use in Ethernet/IP networks. The DIN-rail or screw-mounting controllers are compatible with a variety of SMC stepper motors and can be ordered as a package with an actuator and cable under a single code number. WEG unveiled a new range of compact water-cooled motors from its German subsidiary AKH, which are available in efficiencies up to IE3 and power ratings up to 700kW. The low-noise K1W motors are aimed at applications where space is limited, an external fan cannot be used, or the motor heat cannot be dissipated directly. 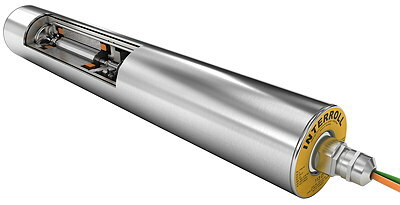 The IP55 motors cover shaft heights from 200–355mm and have Class F insulation. Yaskawa has extended its Sigma-7 servo system to include a dual-axis model with a built-in controller. The Sigma-7C version avoids the need for a bus cable between the controller and servo amp, saving 34mm of space inside control cabinets, according to Yaskawa. Four external axes can be controlled or synchronised with the controller via the Mechatrolink-III network. A 3.1kHz bandwidth boosts throughput. Yaskawa has also added 400V versions to the Sigma-7, covering ratings from 6–7.5kW and 11–15kW. ABB is now offering a wireless link to its 800xA control system from iPads, giving personnel access to real-time information from production lines. The customisable 800xA iPad Operator Workplace takes into account the relatively small screen of the tablet computer. Baumüller is offering new energy-efficient Intel Skylake processors for its scalable b maXX PCC04 box PCs, which support four USB 3.0 ports. Built-in EtherCat masters allow the PCs to be used at the top control level or as slaves in Ethernet-based systems. Beckhoff announced a family of DIN-rail-mounting industrial PCs based on Intel Xeon D processors with up to 12 cores. Multi-core support from the company’s TwinCat 3 software allows tasks to be distributed across the cores for enhanced efficiency. The Taiwanese automation manufacturer Delta Electronics launched a new mid-range PLC based on its patented, screwless backplane-free design which allows modules to be “clicked” into position. The AS300 PLC (below) uses Delta’s own 32-bit System-on-Chip CPUs and can execute 40,000 steps/ms. It can control up to eight axes, support up to 1,024 I/O and accommodate 32 extension modules. Ladder instruction times are 25ns and response times are 1ms. Delta also launched a handheld HMI that allows operators to move around machines and interact with them in real time. The IP55-protected DOP-H HMI has a high-resolution 7-inch display and an emergency-stop switch. It can communicate using Ethernet or Modbus, while an optional manual pulse generator allows motion systems to be controlled. The Israeli motion control specialist Elmo unveiled a four-core, EtherCat-based motion controller that can handle 32 synchronised axes in 250µs and promises cycle times down to 100µs. The Platinum Maestro controller uses a smart distributed clock system which results in cycling jitters as low as 10µs. Elmo was also demonstrating its Gold Twitter servodrive which weighs 18g, measures less than 13cm3, yet can control 4kW at up to 50A, 200V. Elmo claims that it is the smallest high-power servodrive on the market. Italy’s ESA Automation had several new arrivals including its Android-based Esaware Web Panel which can be used to visualise content from any Web server compatible with HTML5 and Web Socket. The ESA Automation Cloud allows export and access to any production data, while the Esaware Router opens up ESA’s Everyware remote maintenance platform to third-party devices. Finally, a new PCIe card allows you add up to three independent Can Master ports to a PC. Harting was showing prototypes of its Mica open modular computing platform with EtherCat connections. The IP67-protected systems can capture data directly from production networks via two M8 connectors and pre-process it, before transmitting the data to higher-level systems and the cloud via OPC-UA or MQTT. The US firm Kingstar used SPS to launch its software-based motion control platform on the European market. The Soft Motion platform is said to cost up to half as much as hardware-based systems, while offering deterministic real-time functions including PLC, machine vision, and EtherCat functions. The platform, based on Windows 10 IoT Core, is aimed at users wanting to replace Windows Embedded CE and seeking real-time links to Microsoft’s Azure cloud and services. Lenze has expanded its 3200C DIN-rail-mounting motion control platform with new processors that double its performance and allow more coordinated axes to be controlled. The controllers, designed for use in decentralised control cabinets, do not need fan cooling or air-conditioning, resulting in robust, maintenance-free operation. Lenze has also put together a time-saving package consisting of its p300 panel controller, i500 drive and PLC Designer programming and drive-parameterising software. Mitsubishi announced a “hyper-fast” CNC controller designed to sit alongside its iQ-R series PLC and to share the same high-speed bus, to create a single control platform capable of managing complex production lines. The C80 CPU provides nanometre-scale control over machine-tool functions and incorporates a package of safety functions covering drives, sensors and communications. The CNC and PLC (below) are programmed in the same environment, saving design and commissioning time. Pepperl+Fuchs was showing a new generation of intelligent thin-client systems for remote monitoring in Zone 1/21 hazardous areas. The VisuNet GPX HMI uses the RM Shell 4.1 firmware which replaces the Windows desktop and makes system set-up and integration fast and easy. Pilz’s standalone PMCprimo MC and drive-based PMCprimo C motion control systems now come with a 1.3GHz processor for enhanced performance, productivity and quality. Schneider Electric's Pro-Face subsidiaryhas added 10”, 15” and 22” models to its PS5000 family of panel PCs which need 66% less depth and offer a 280% increase in performance, compared to their predecessors. It has also added a 4.3” touchscreen to its GP4100 series, with a choice of communications: RS-232; RS-422/485 and Ethernet. The materials-handling specialist Schunk has developed a PLC function module to accelerate the programming of two of its high-speed pneumatic pickers: the PPU-P pick-and-place system and the DRL lift/swivel system. Preset sequences can be integrated into standard PLC software and tailored easily for specific applications. The tool runs under Codesys, TwinCat, Siemens TIA, and Step 7. Siemens announced a series of thin, multi-touch, widescreen (16:9) monitors and panel PCs which can differentiate between correct operation and the effects of water drops, cleaning operations or a touch by the heel of a hand. The IPC277E panel PC is available with 15” and 19” displays, while the IPC477E panel PC and flat panel monitors are also available in a 22” format. Siemens has also enhanced the capabilities of its Logo! 8 logic modules, including extending their operating temperature range down to –20°C. The Modbus TCP/IP protocol has been added to the modules, while date and time synchronisation in accordance with the NTP standard allows all of the devices in a network to synchronise themselves automatically. The modules can now run as a client and server simultaneously. Sigmatek has added two 37.5mm-wide dual-core CPU modules to its S-DIAS control system, capable of handling up to 64 I/O modules. The CP 311 module has one Ethernet and two Varan ports, while the CP 312 has two Ethernet and one Varan. One core handles real-time and cyclic tasks, while the other runs the Linux-based operating system and background tasks. 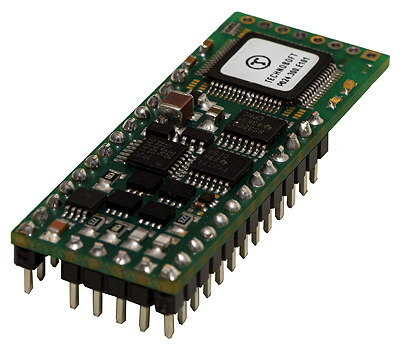 Technosoft has released a tiny (19 x 46 x 8mm) intelligent drive with built-in motion control for positioning applications where space is critical. The iPos2401 controller (below) can handle brushed or brushless DC, stepper or linear motors with continuous currents of less than 1A. It is designed to mount on a motherboard and supports TTL encoders or digital Hall position sensors. One of a handful of UK exhibitors at SPS, Trio Motion Technology, launched a 64-axis EtherCat controller that is combined with an industrial PC in a compact enclosure. The PC-Mat 64 is based on a quad-core Atom processor and uses a real-time extension to allow both Windows and the motion controller to run directly on their own cores. An EtherCat master port can launch data packets with less than 1µs of jitter. The controller supports servodrives, I/O and other devices from more than 100 manufacturers. Trio was also showing an EtherCat-based I/O system that offers flexible expansion for motion applications with masters from Trio or third parties. The rail-mounting Flexslice system supports EtherCat cycle times down to 250µs. 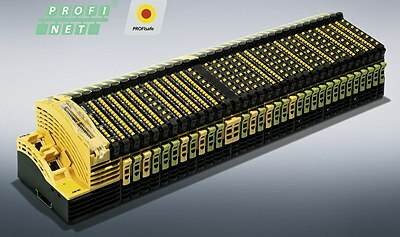 Sub-modules can be added to an EtherCat network with no loss in performance. Yaskawa subsidiary Vipa has boosted the performance of its SLIO (slice I/O) family by 25–50%, increased memory sizes by up to four times, and added communications functions – including a two-port switch for Profinet and Ethernet, and two RS-485 ports which support optional Profibus master/slave functions. Vipa has also upgraded its 300S PLCs, providing up to three times more memory, and supporting standard SD cards for external memory. EtherCat versions are 20–30% cheaper than previous models. Finally, Vipa has added RFID readers to its touch-panels to provide access control. Wago has added a Profibus controller with a DP Master interface to its PFC200 family. The controller collects data from subscribers on a Profibus network, processes it, and provides high-speed communications with sensors and actuators. The controller is also available in a variant with a wide temperature range (–20 to +60°C). At SPS, Weidmüller announced new PLC migration interfaces for Rockwell PLC5 and Honeywell LogicMaster IPC 620 controllers. 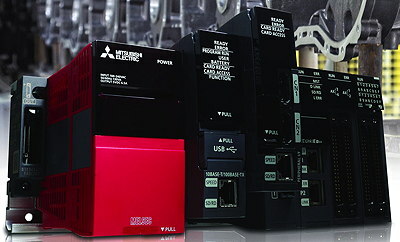 The interfaces allow users of these system to upgrade to more modern controllers in hours, rather than days, by connecting the new PLCs to the existing field wiring and avoiding the need for recabling. The PLC5 migration PCBs can be placed on an old PLC5 rack or on a DIN rail, while the 19” IPC 620 migration racks simply replace the old system. ABB unveiled a range of 22.5mm-wide electronic starters which, it claims, will cut cabinet space requirements by up to 90%. The HF starters – for motors up to 3kW, 400V AC – combine the advantages of electronic and mechanical relays and are said to have lives of 30,000 switching cycles. Overload protection, reverse rotation and emergency-stop functions are built in, cutting installation times by up to 75% compared to using separate components, as well as minimising the risk of wiring errors. There are five versions of the DIN-rail-mounting devices which can be controlled from 24V DC PLC outputs. ABB also has a new range of safety relays with a multi-reset function that allows up to ten to be reset using one switch. Manual or automatic reset are selected using a front-panel switch. The Sentry range includes versions with timers from 0–999 seconds, claimed to have an accuracy of better than 1%. There are four main versions, ranging from basic models for applications such as emergency stops, to universal models with extra display and configuration options. Balluff claims to be the first supplier to offer safety functions via IO-Link. Safety devices are connected using low-cost M12 cables to an I/O module which is connected, in turn, to an IO-Link master, with safe communications with the control level provided by Profisafe/Profinet. Safety-relevant data is transferred via the master to a safety controller using a “tunnelling” technique. Balluff says that this approach saves time and cabling costs as well as control cabinet space. It conforms to SIL 3 / PL e.
Eaton launched two families of easy-to-install, space-saving command and signalling devices. The RMQ Flat Front devices, for 30mm mounting holes, include pushbuttons, indicator lights, joysticks, and potentiometers, as well as an encoder that combines turn and push functions. They offer protection up to IP69K. The RMQ Flat Rear devices are less than 30mm deep and include multi-colour LEDs for use as indicators and alerts. The safety specialist Euchner unveiled a flexible, modular version of its MGB multifunctional gate box. The MGB2 (below) allows all relevant functions to be integrated into one device – two sub-modules can each contain up to three controls. A Profinet/Profisafe bus module can be connected directly or remotely. Euchner also had several new safety switches, with and without transponders, solenoids, bistable locking functions and Atex protection. Kendrion Kuhnke Automation has entered the safety control market with a Codesys-programmable safety controller and a certified safety I/O terminal. The SIL 3 Kuhnke FIO Safety PLC conforms to IEC 61508 and supports many PLCopen safety functions. 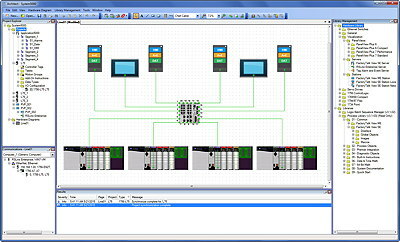 Programming and configuration can be done in Codesys and transferred via EtherCat/FSoE. The new Kuhnke FIO Safety IO 4D1/2DO safety EtherCat terminal has two safe input channels and two safe output channels. It can be used with an FSoE master. 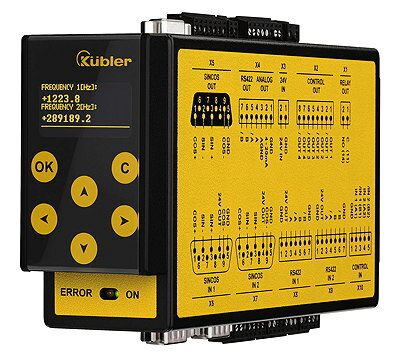 Kübler announced a retrofittable speed-monitoring device with a removable OLED operating and diagnostic display. 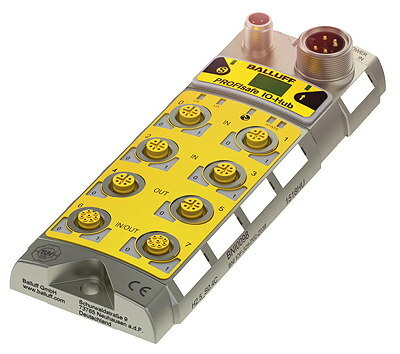 The rail-mounting Safety-M module (below) has an encoder signal splitter which reduces external wiring. Speed and position-related safety functions include SS1, SS2, SOS, SLS, SDI and SSM. Up to two safe encoders connections are possible per axis. A new safety controller from Lenze combines drive, control and safety technologies and is set up using a single PLCopen-based engineering tool. The c250-S controller works with ready-made modules from Lenze’s Fast Application Toolbox to, for example, reduce a traversing speed while simultaneously monitoring safe maximum speeds. The controller provides detailed diagnosis messages rather than simple error messages. 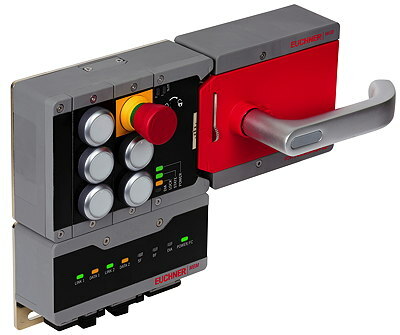 Leuze electronic has added more than 20 items to its programmable safety control and relay portfolio. The 45mm-wide MSI 400 controllers offer 24 I/O, and an Ethernet interface, with support for Profibus and Ethernet IP. The controllers, which can monitor simple safety functions or perform more complex safety tasks, can handle up to 116 safe inputs and 56 safe outputs. The new 22.5mm-wide safety relays can be used for tasks ranging from monitoring devices such as e-stops and sensors, to standstill monitoring of motors. New from Phoenix Contact is an electronic circuit-breaker that protects four channels from overloads and short-circuits. The individual channels in the CBMC breaker can be adjusted without tools, using LED buttons. There are two versions, for 1–4A and 1–10A. Pilz launched a new generation of field-level devices for safety and automation duties with its PSSuniversal 2 decentralised I/O system, which consists of a Profinet module and I/O modules. Diagnostics can be performed in the remote I/O, simplifying service and maintenance. Modules can be hot-swapped without needing to be reconfigured. The PASconfig tool allows systems to be designed using drag-and-drop functions. Larger projects can now be handled by Pilz’s PNOZmulti 2 configurable control system, which now accepts up to 12 safe expansion modules on its right-hand side. A new module with 14 semiconductor outputs is also available. The new modules allow users to pay only for the functions that they need. A new connection to Modbus/TCP helps to save on hardware costs and to communicate faster. The Italian safety specialist Pizzato Elettrica launched a series of safety switches with solenoids that allow PL e and SIL 3 to be achieved using a single device. The NS series switches use RFID technology for contactless activation. 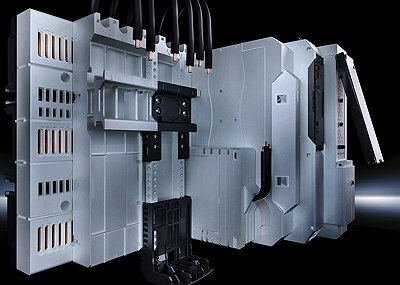 The top modules, incorporating the release devices, and the lower modules, with the connection outputs, can both be rotated. The switches are available in IP67 and IP69K versions. Rittal announced a compact busbar system for controller and switchgear applications up to 125A. The RiLine Compact system (below) consists of a baseplate containing protected busbars that are contacted via a grid in the top cover. Control and protective devices are connected via adaptors. There are various functional modules for motor and power control, as well as adaptors for round conductors. The system can be installed safely without tools. Rittal has expanded its portfolio of LED-based enclosure lighting with 600-lumen versions suitable for its large TS8 enclosures, and 400-lumen versions suitable for wall-mounted enclosures such as the AE series. The lights have plastic covers that incorporate Fresnel lenses that direct the light to illuminate the entire enclosure from top to bottom. The lights operate from 100–240V AC. Rittal also introduced an all-electric wire stripping and crimping machine that can be used in locations where there is no compressed air supply. The R8E machine can handle cables with cross-sections from 0.5–2.5mm2. Schaffner announced a series of modular, passive harmonic filters which, it claims, are the smallest on the market. Performance can be optimised by adding plug-in modules. The ecosine evo filters are designed for use with three-phase diode and thyristor rectifier systems, and can achieve a THID of less than 5% even without a DC-link choke in the drive. The filters are available in ratings from 1.1–250kW, in IP00 or IP20 versions. At SPS, Schmersal launched a series of aids for wiring safety switchgear in series. Devices such as sensors and interlocks can be mixed, and wiring is reduced. 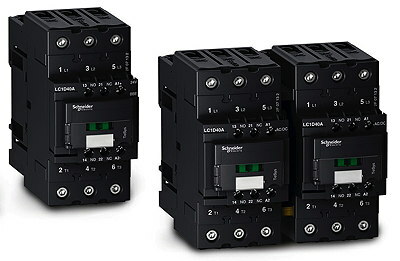 For electronic safety switchgear, a new passive distributor module and passive fieldbox allow mixed series connections with up to four switchgear devices per module. The modules can accommodate wire cross-sections up to 1.5mm2. For safety switches and sensors, the SRB-E safety input expansion handles active electronic signal evaluation. Schmersal has also developed a range of easy-to-fit cross-switches with a “unique” non-contact switching system. The RK/NK switches include hygiene-compliant variants. A sealing system with up to three barriers prevents the ingress of liquids, even if the sealing bellows are damaged. Schneider Electric released a series of contactors with electronically controlled coils which, it says, consume up to 80% less energy and generate up to 50% less heat than contactors with electromechanical coils. The compact TeSys D eco contactors (below) cover AC and DC voltages from 24–500V in four frame sizes. A special 24V DC, 500mA version can connect contactors from 40–65A directly to a PLC without needing a relay. A new transponder safety switch from Sick is aimed at applications requiring tamper-proofing. The STR1 switch (below) supports various coding types and has monitored semiconductor outputs. It can be connected individually or in series (up to 30 devices), and complies with PL e. Sick says that users will be able to avoid precautions such as concealed mounting and additional interlocking. Wago claims that its new 6mm-wide Epsitron single-channel ECBs (electronic circuit-breakers) are the slimmest devices on the market. The ECBs, available in 1/2/4/6 and 8A models at 24V DC, can be used for secondary-side fusing with long lines or small cable cross-sections where MCBs and fuses won’t work. In the event of a hard short-circuit, triggering occurs after 4ms. WEG launched a range of modular MCCBs (moulded-case circuit breakers) that can interrupt short-circuit currents up to 80kA. The DWB breakers, with operating voltages up to 690V AC or 250V DC, are available in three- and four-pole versions in six case sizes with rated operating currents from 16–1,600A. The MCCBs can be switched remotely. The modular design allows the complexity of the breakers to be adapted to the application. Weidmüller was showing a new range of high-end power supplies that use a current-limiting technology said to deliver a wide dynamic range for the reliable triggering of circuit-breakers and powerful motor starts. The PROtop supplies can handle rapidly pulsating DC loads and high peak current capacities for triggering breakers reliably. They are available as single-phase devices (24V, 5/10/20/40A, with widths from 35–124mm) with three-phase versions to follow. Efficiencies are up to 95%. Werma demonstrated a new generation of easy-to-install 70mm-diameter modular signal towers which, it says, offer the best visibility from any angle. The KombiSign 72 towers provide up to five tiers of lights in two design options. 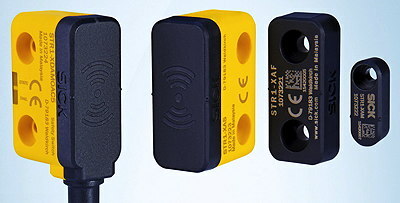 Werma is also offering IO-Link connections for its KombiSign 40 and ClearSign signal towers, allowing simplified control via IO-Link master ports. This is said to save both time and money compared to traditional hard-wired controls. Halstrup-Walcher claims to have developed the first positioning axes to incorporate IO-Link. Its 3-series positioning systems are connected using a single unshielded IO-Link cable for both power and data. The systems – which include a motor, gearbox, comms and an absolute encoder – support a “time stamp” process that guarantees that machinery format changeovers start at the right time. They can deliver torques from 1–25Nm and are available with IP54, IP65 or IP68 protection. 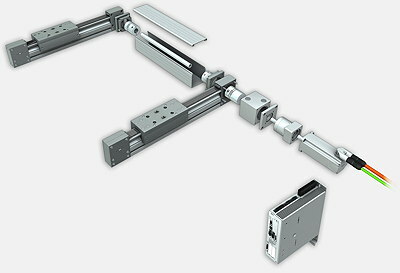 The German machine components supplier item, appearing at SPS for the first time, was previewing a linear motion system (below) that consists of more than 60 compatible components, including motors, gearboxes, controls and cables. Web-based software calculates the optimum combination of components needed to meet a user's requirements. The assembly is delivered pre-configured and ready to install. Item says this approach will simplify the installation and commissioning of linear systems. Rexroth was demonstrating a free, downloadable selection and sizing tool for its linear axes and actuators that guides the user through around 100,000 possible product variants in five steps. The LinSelect tool uses algorithms containing application-specific know-how from Rexroth’s linear motion specialists. Selected products (including motors and drives) can be transferred to an online configurator and CAD models are available in common formats. Yaskawa has developed an application-specific linear axis based on its SGT linear slider and using a flat, iron-free motor suitable for tasks in tight spaces or with high dynamics. A patented technique for minimising latching forces ensures constant speeds and cuts positioning times by up to 30%. The low-maintenance axes include rails, guides, carriages, linear motors, encoders and power supplies. Wittenstein has extended its portfolio of quiet, lightweight servo-worm gearheads with a lower-cost version called V-Drive Basic which comes initially in two sizes, with hollow or solid shafts, and five reduction ratios. Torsional backlash ranges from 10 arc-min to more than 15 arc-min, and noise levels are maximum of 65 dBA at full load, and no more than 50 dBA at “medium” speeds. Corrosion-resistant versions are available, as are variants with stronger bearings. At the same time, Wittenstein has upgraded its two other worm gearheads, boosting torque by up to 20% and improving torsional backlash. The V-Drive eco has been renamed V-Drive Value and backlash has been cut from 8 to 6 arc-min. The V-Drive+ has become the V-Drive Advanced, with backlash reduced from 3 to 2 arc-min. Service lives exceed 15,000 hours – 25–50% better than the market standard, claims Wittenstein. New from Balluff is an absolute position measuring system for determining positions and end-of-travel with an accuracy of up to ±15µm and a resolution of 1µm, over distances of up to 8m. The BML SL1 system is suitable for tasks involving linear or rotary motion, distance or angle measurements, and format changes. An IO-Link interface provides data transfer, parameterising and diagnostics. The IP67-protected read-head can operate over a distance of up to 1.3mm. Baumer had several new products at the SPS show, including a simple, non-contact system for measuring circle centres and diameters and the highest, left and right positions of round objects up to 130mm in diameter. The laser-based PosCon CM system needs only one sensor and does not require a reflector or extra software. It is ready for use in a few minutes and displays values directly in mm. Baumer was also previewing a series of 3D cameras with built-in image pre-processing for laser triangulation. The LX VisualApplets cameras offer a choice of resolutions and line widths and are said to identify the slightest deviations, even at high speeds. A new range of Ethernet-based VeriSens vision sensors are claimed to double productivity in image-based quality inspection tasks. Finally, Baumer was displaying a new generation of its Magres robust magnetic absolute encoders with a maximum angular accuracy of 0.15 degrees, allowing them to be used in positioning applications that would previously have needed optical encoders. The 58mm-diameter EAM580 and 36mm EAM360 are available with support for Profinet and OPC UA. 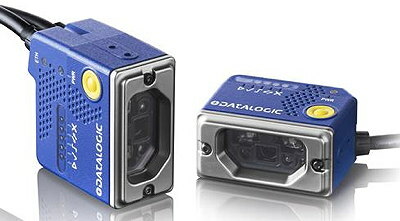 The Italian sensor-maker Datalogic was demonstrating what it claims is the smallest 2D imager on the market. Its IP65-protected Matrix 120 imager (below) is available in a choice of formats, including WVGA, 1.2-Megapixel, wide-angle, 1D code-reading and polarised (for reflective surfaces). Versions are available with built-in Ethernet. Datalogic also announced an “extraordinary” software algorithm for object recognition in machine vision applications which, it claims, can recognise thousands of different objects according to their appearance, allowing, for example, products to be recognised without barcodes. The Impact Pattern Identifier can find objects even when they are partially hidden or in a cluttered field-of-view, and is not affected by rotations, perspective distortions, varying scales and light fluctuations. The German sensor specialist ifm electronic had a clutch of new arrivals including a 3D smart camera which, it claims, is the first to also have a built-in 2D camera. The O3M251 sensor is aimed at mobile applications and includes an overlay function that shows obstacles and displays warnings, symbols and even complex drawings in real time. An evaluation system which can help to avoid collisions is built into the camera. Also from ifm is a range of inductive sensors that can transmit distances as linearised process values. The devices can be used as switching sensors with adjustable switch points, or as measuring systems with values transmitted via IO-Link. The output can be set as NC or NO, and PNP or NPN, via IO-Link, thus reducing stockholding. A third new range from ifm consists of miniature photoelectric sensors with a range of up to 80mm, independent of the object’s colour. The O8 sensors (below) can detect small and flat components, even with dark or polished surfaces, and their range can be set to the nearest millimetre via IO-Link, avoiding the need for complex adjustments of range. Kübler has developed a hollow-shaft (up to 15mm) optical encoder for motors that has a mounting depth of just 43mm – 27mm less than the company’s Sendix 5883 multiturn encoder fitted with a gear, on which it is based. Kübler describes the Motor-Line version of the encoder as “a milestone” that opens up new possibilities when installing encoders in tight spaces in geared motors. Available interfaces include SSI, BiSS, SinCos, RS-422 and Push-Pull. Kübler also has a new family of IP69K draw-wire encoders for use in tough environments. The D120 encoders can measure distances from 3–10m, with a linearity of ±0.1%. They are available with stainless-steel wires from 0.5–1.5mm thick, and with various analogue outputs including 0–5V, 0–10V, 4–20mA, as well as a potentiometer output and a CANopen port. Leuze electronic was demonstrating a contrast sensor that uses LEDs in three colours to determine the colour that produces the maximum contrast with a detected mark. The KRT 18B sensor ensures reliable detection, even with glossy surfaces or fading marks. Switching points can be varied using a self-adjusting bargraph to display signal quality. Pepperl+Fuchs is offering plug-and-play light section sensors that incorporate vision sensors. There are two versions: the SmartRunner Matcher recognises a previously taught reference contour; while the SmartRunner Detector monitors a taught scene for the entry of foreign bodies down to 1mm in size that could pose a danger to machinery. The sensors are factory-optimised for specific applications. They can be parameterised by reading dot matrix codes. Powerful LED lighting allows them to capture images for documenting errors, quality and process conditions. P+F also has a 6mm-wide rotation speed monitor that it says can process inputs from any binary sensor, including Namur and SN devices. The SC-System can detect signals up to 30V and input frequencies up to 50kHz. A restart inhibit function can be used to restart the module after limit values have been exceeded to ensure that any faults are rectified before restarting. P+F was also demonstrating a wireless system that supplies power inductively to sensors on moving machine parts and transmits signals as well. The WIS 2 system avoids the need for wear-prone cables or sliprings and can transmit up to 12W of power over distances of up to 7mm. It is available in two- or eight-channel versions. Schneider Electric was demonstrating a family of electromagnetically-immune, non-flush inductive sensors in three sizes: 12mm-diameter with a detection range of 8mm; 18mm with a range of 16mm; and 30mm with a range of 30mm. the Telemecanique OsiSense XS sensors are available as IP69K plug-in versions, or cable-connected versions (IP67 or IP68). 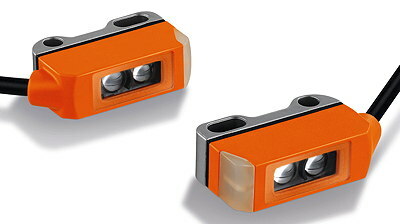 Schneider has also revamped its OsiSense BL proximity sensors with a new design and improved functions. The IP67 sensors, available in flush and non-flush versions, have ranges from 2–­8mm. New from Sick is a series of inductive proximity sensors with four programmable switching points and switching windows, and two programmable end-stages, which can replace several conventional devices. The IO-Link-compatible IMC sensors have adjustable switch-on and switch-off delays to help suppress unwanted switching pulses. They have on-board logic, data evaluation, temperature measurement and diagnostics functions, and allow hysteresis to be set. The American motion control supplier US Digital has added 400 and 500 CPR (cycles per revolution) models to its E4T line of miniature optical encoders – a 38% increase in available CPR, supporting applications up to 2,000 pulses/rev. The devices use transmissive optical sensing to deliver position and velocity feedback, and are available with both single-ended and differential signal outputs where noise immunity is critical. At SPS, Balluff announced a small, bidirectional IO-Link data memory module for applications such as milling heads which are switched from one machine to another. The IP67-protected module carries operating data such as the number of cycles operated, shock and vibration values, and lubrication intervals. All of this data is loaded automatically into the NC controller and is available for maintenance personnel. Balluff also introduced a range of four-port masters with four IO-Link ports for Profinet, Ethernet/IP and EtherCat. The ports process analogue and digital data, both in and out. 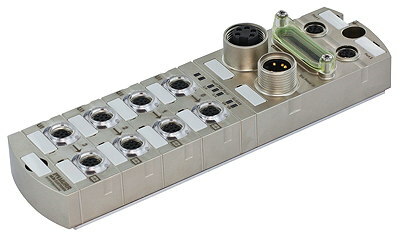 By connecting four hubs, up to 124 I/O can be operated, with big cost savings compared to using standard fieldbus modules. The IP67 diecast zinc housings also contain a two-port switch for extending networks, and a Web server for diagnostics and parameterising. Balluff also has a new family of rugged IO-Link sensor/actuator hubs with M8 connections and a choice of eight inputs or eight configurable I/O. The company claims that the hubs can cut costs by up 50% when the savings in cables are considered. One bus address can collect sensor signals from a 20m radius. Belden was demonstrating the capabilities of TSN (Time-Sensitive Networking) as well as displaying a clutch of new products including: an Ethernet switch that can transmit data at up to 2.5Gbit/s; a wireless access point that can transmit data at up to 867Mbit/s; a fibre optic repeater that increases the range and availability of Profibus networks; and a pre-terminated, pre-tested optical fibre termination system. Eaton has collaborated with Hillscher to develop a Sercos III gateway for its SmartWire-DT wiring and communication system. The EU5C-SWD-Sercos gateway transfers up to 1,000 bytes of I/O data from up to 99 connected SmartWire-DT devices via the Sercos protocol to a PLC or other controller. It supports both cyclic and acyclic communication. The gateway includes a 100Mbit switch and a USB port for diagnostics. Kübler has developed a 120mm-diameter slipring with a special shielding concept that allows safe, parallel transmission of signals, loads, data and Ethernet. The modular SR120 slipring can be expanded up to 20 channels and be provided with a lead-through for air or hydraulic pipes. The low-maintenance, IP65-protected ring has an aluminium or stainless-steel housing. Murrelektronik announced a gateway for its Cube modular, decentralised fieldbus system that provides a quick and easy way to read diagnostic data from the system. The robust gateway (below) is integrated in the cable between a fieldbus node and up to four branches. When starting a Cube system, the gateway reads the topology as well as process and diagnostic messages and prepares this data for display via a browser. Pepperl+Fuchs was showing a new Ethernet I/O module that can be used independently of a control panel and can supply up to 16A via an L-encoded M12 plug. The module supports all of the common Ethernet protocols, including Profinet, Ethernet/IP and EtherCat, with changes between protocols made using a rotary switch. A built-in Web server can be used for parameterisation and addressing, as well as retrieving status and diagnostic information. New from Phoenix Contact is a range of intelligent switches that allow networks to be established and monitored during series production of machines. The FL Switch 2000 series are an alternative to unmanaged switches. They are said to reduce data loads on networks and to maintain communication in the event of unwanted loops or device failures. A “unique” unmanaged mode makes these functions available when using the switch as a passive network device. Siemens announced a new generation of compact industrial Ethernet switches that can be used to set up electrical and optical line, star and ring network structures. The Scalance XC-200 switches are available in versions with up to 24 RJ-45 ports and two ST/BFOC or SC ports The layer 2 devices can be integrated into Profinet or Ethernet/IP networks, and have redundant power supplies. The SC206-2SFP model has two Gigabit ports with a single-mode fibre range of 200km, and a multi-mode range of 5km. Steute presented a second generation of its sWave.Net wireless access points which bundle signals from wireless switchgear and send them to IT systems via Wi-Fi or Ethernet. The new versions are smaller, consume less power and have variable input voltages from 12–24V DC. They send wireless signals directly from access points to IT systems without needing the previous application server. TE Connectivity presented a smart I/O module that captures, filters and prepares data from machinery sensors and actuators and sends it to the cloud without affecting the performance of the control network. The IoT OmniGate module reads, processes and forwards the data using a uniform model that can be processed directly by IT systems. It can replace existing I/O modules to upgrade older machines. Wieland unveiled a series of Ethernet switches including: the 30mm-wide, five-port wienet UMS 5-W entry-level device; the wienet UMS 8-4PoE-W device with eight Fast Ethernet ports, four of which support Power-over-Ethernet, thus carrying both energy and data; and the 16-port wienet LMS 16W Light Managed Ethernet switch, which combines the advantages of unmanaged and managed switches. Wieland also has a new rail-mounting WLAN access point that supports IEEE 802.11n/g/b and Ethernet 10/100 BaseT. The rugged, low-power-consumption wienet AP-ETH-A module is available with a built-in antenna or connections for external antennae. ABB has integrated its Automation Builder 2.0 with Copa-Data’s zenon data collection, analysis, visualisation and management software. It says that this will allow users to get all of their automation software from a single source and make it easier and quicker for them to develop effective installations. The integration of the packages also avoids the need to enter data twice, thus ensuring consistency of information, reducing risks, and improving productivity. Beckhoff has integrated OPC UA Pub/Sub UDP communications into its TwinCat 3 runtime software, simplifying configuration and the exchange of real-time data. The publisher/subscriber model decouples conventional client and server applications from each other. The publisher sends its data to a multicast group to which the subscribers subscribe, rather than communicating with devices. Communication is initiated directly from TwinCat 3, creating a deterministic real-time channel via OPC UA. 3S-Smart Software announced a Codesys service pack which, it says, will cut development times significantly. A new “device application” includes code that typically does not change during programming – for example, I/O configurations, global variable lists and project-specific libraries. User programs are therefore compiled and downloaded to controllers much faster than before. Eplan has collaborated with ProCad to develop software that integrates with ProCad’s PDM system. The Pro.File system offers design data management, bills of materials management, and parts synchronisation and authentication. Eplan was also previewing a new system for automated system design, as well as its Syngineer platform, announced at last year’s Hannover Fair, which brings together mechanical, electrical and software engineering. It is due for commercial launch in the spring of 2017. Eplan was also demonstrating a new version (2.6) of its Harness proD wiring and wire harness engineering software with improvements including automatic dimensioning and the inclusion of wiring drawings as well as nail boards. Eplan’s sister company, Rittal, was demonstrating a new online configuration system for small enclosures, which allows users to choose items from a range of more than 250 accessories and add them to the design. A “smart” 3D modelling function displays only those components that are compatible. Rittal has also updated its RiDiag diagnostic and parameterisation software for cooling systems, making it easier to use. Version 3 of the software include an “Efficiency Cockpit” where users can see data such as motor currents, temperatures and input voltages, helping to cut energy consumption. The new version also offers maintenance support including displaying error and status messages and advice on fixing faults. Rockwell Software has enhanced its Studio 5000 development environment which now includes expanded integration with engineering tools, ready-made application content to replace custom code, and new functions to enhance security. The software (below) can now exchange data with tools from Eplan and AutoCAD, reducing the need to re-enter data, while an add-on graphics capability allows users to create their own re-usable graphics. Finally, Siemens has added many new functions to its Energy Manager Pro software, which analyses energy consumption across several sites or company-wide. Version 7.0 has a new widget-based Web dashboard for creating customised visualisation and analyses of energy data. Ready-made widgets include line diagrams, reports, pie charts, gauges, and traffic lights. There is also a new link to the Simatic Energy Suite, which holds production-related energy measurement data. The next SPS IPC Drives show will take place from 28–30 November, 2017, in Nuremberg.